Camaro Marketing Manager of Performance Cars John Fitzpatrick gives an exclusive walkaround of the 2014 Chevrolet Camaro SS RS. John Fitzpatrick Chevrolet Marketing Manager performance cars gave an exclusive walk around of the 2014 Camaro SS with the RS package and gives us highlights of the new features. 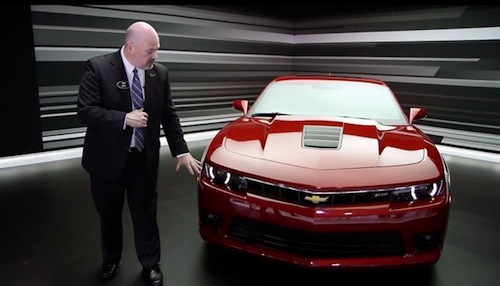 While all the attention at the 2013 New York International Auto Show was on the new 2014 Z28, the Camaro SS still has some changes for the Camaro marketing manager to talk about. But will the changes be enough to get performance fans excited? Fitzpatrick starts at the front on the candy apple red 2014 SS RS coupe. He begins by highlighting all the new features and discussing the styling and performance enhancements for the 2014 model year. The design team has two objectives as they gave a mild refresh of the 2014 Camaro. The objectives were to differentiate between the V6 and V8 models, and to add more flair to to the RS package. Many of the styling elements of the Camaro Zl1 can be seen incorporated into the SS. The Camaro marketing manager makes note that the new hood extractor on the SS is functional and similar to the one featured on the 2014 ZL1. Its function is to bring in air to the engine compartment and cool the 6.2-liter V8 engine before exiting below. Also on the front of the new SS is a new lower opening grille also similar to the ZL1 and it also receives silver trim added to the top of the grille for extra flair. The new model SS keeps the halo ring headlights from the previous year and functional foglamps have been added for the first time. John Fitzpatrick moves to the back of the new red SS and points out the “striking” differences on the back of the car. He points out that the thing people will notice immediately are the new taillamp. The two lens were brought into one lens across the back of the car. Buyers who order the RS package will get new LED lamps that will further differentiate the sporty package. While the 2014 SS model doesn’t get any changes to the interior, Fitzpatrick does say that with the introduction of the ne w2014 Z28, Chevrolet was able to bring optional Recaro performance sport seats into the SS for the first time. He says it’s for buyers who will take the SS to the track. Are there more changes coming to the Camaro or is this all Chevrolet has to offer? The refreshed Camaro SS is powered by the same 6.2-liter V8, mated with the standard six-speed transmission. It pumps out 426 horsepower and 420 lb.-ft. of torque. Chevrolet still offers the six-speed automatic transmission with Active Fuel Management, which offers 24 mpg highway but delivers only 400 horsepower. The Mustang fighter also comes with Launch control on the manual transmission SS that helps control wheel spin for faster 0-60 times. TAPshift manual controls on the automatic SS gives drivers more control over gear selection for more spirited driving. Camaro SS still comes with a performance-tuned suspension with tuned stabilizer dampers for improved handling in the corners. 20” wheels are wrapped in Pirelli PZero performance rubber and Brembo brakes are standard. The two minute video below by Chevrolets John Fitzpatrick is supposed to get us excited about the newly refreshed 2014 Chevrolet Camaro SS with the RS package. But the Marketing Manager of performance cars at Chevrolet doesn’t seem all that excited about the shiny red Camaro. Maybe it’s an indication of what performance fans will feel too when they see the new changes. Chevrolet will need to do a lot more than make a few cosmetic changes to keep up with the new 2015 Ford Mustang when it arrives next year.